Hopefully, there were some eggs getting laid directly on the bait - because I only got a handful so far on the trap and I don't see any anywhere else in the enclosure yet. One thing I am seeing a lot of is, apparently, fly poop. After installing my nice white circular flyperches... they became visibly spotted with yellowish specks. I can't imagine it's too much of a problem, but the perches are also a favorite spot for the flies to get a drink when I mist the enclosure... should I be concerned about them drinking their own poo? File comment: Dying flies clawing themselves out of the pit of corpses. Just went and looked again, and now there's 7 females with their posteriors probing the waffle block... maybe I'm just seeing the thin end of the wedge here. I think my next egg trap should be made of walnut, or stained with something dark and non-toxic. It looks like there might be more eggs in it that I originally though, but they blend in rather well. ... One thing I am seeing a lot of is, apparently, fly poop. After installing my nice white circular flyperches... they became visibly spotted with yellowish specks. I can't imagine it's too much of a problem, but the perches are also a favorite spot for the flies to get a drink when I mist the enclosure... should I be concerned about them drinking their own poo? I don't think so but that's just a guess. On my bin I mist the walls which, of course, have their share of fly spots. I can't say definitively that it affects the flies or not but the population as a whole survives. What gets me is that if you look up Lekking behaviour of the black soldier fly then you would have the impression that the male flies are highly territorial and tackle both male and female interlopers that dare to venture near their 'territory' (AKA a leaf). However from jf371's pictures you can see that they are quite happy to share space with one another. Same is true in my enclosure. For those who have active breeding populations, what does the actual mating behaviour look like? Do two flies spontaneously start hovering around the enclosure and then crash into one another and mate? Does one fly get too close to another? I see that behavior too but then one will move and others react to it, then more so there's a short flurry of flying around after which they all roost again. The actual sparing and mating can be a rough and tumble process. I've never witnessed the violent courtship part - only the calm and prolonged 175 degree interface. Is it normal for adult flies to be enfeebled and flightless for the last few days of their lives? I'm misting them a couple times a day, and we've had warm (but not terribly hot) and humid weather here lately... seems ideal. The corpses are piling up but there's always a bunch of them crawling around on the dead, trying to climb up the sides but failing. It's like their wings don't work and their feet don't stick. I've been wondering - they definitely have some kind of drinking apparatus. I've read they are unable to eat, but could they drink some kind of synthetic nectar to keep energy up? I guess a hummingbird feeder would be too deep - but it seems plausible they might drink from flowers in the wild? I don't know that I've ever seen it documented in a published study but it could be that they eat. We know they do drink and defecate so it seems they have a working digestive tract. Misting with sugar water might work but could be messy. From personal experience if you smear some honey on a surface and then mist it, they get super excited and hang around drinking for ages. I'll try it... I don't have near as many adults now as I had before, but I brought a couple containers (maybe 50-80 prepupae) out of refrigeration a couple days ago. There were at least some survivors in there, so I hope to have another small surge of eclosing adults in coming weeks. Maybe I can keep these invigorated and more interested in mating with some sugar sources. For all the adults I had in relatively close quarters, I didn't see a whole lot of mating and maybe 10-15 egg clusters in my trap (perhaps more in the bait itself). I moved all my baby larvae into the composter today. It's tough to estimate how many there are but it seems like as least as many that I got in my shipment.... So, I'm treading water, at least. Just read that article linked by Aussiemoo - great stuff. Interesting about the growth boost from flax seed - I have some of that in the pantry as well. Bought them a few years back and never used them up. For sugar, I cut an old withered apple in half and took some scoops out of the flesh. I put a blob of honey in the cavity and diluted it with some water. I propped it up in the cage, but I haven't seen any flies at it yet. I also put some honey in a bottlecap and stuck it in a place where it will overflow from the daily misting and spill a little honey-infused water out on one of my fly perches. This did seem to get some customers, but they might have behaved the same for plain water. I have noticed, however, that the adult BSF that buzz around me when I'm tending the bin seem to have a lot more energy. I can't be sure if these are wild flies or some of my own escapees - but there is something different about them. The ones in my cage appear sluggish and docile for the most part. There were some bright sunny days when I had lots of adults inside the enclosure, and there were a few larger, robust individuals that seemed to kinda stir things up - while the majority are content to hang on the screen and only fly if forced to. I guess maybe the answer to this is that my cage is protecting the weak... in the wild, the wimpy flies got eaten or stayed in the bushes while the strong ones strike out and follow their "nose". On the plus side, my second generation of larvae appear to be thriving (despite a little hiccup involving some leftover Korean rice cakes), And it looks like I've got some new adults in the brood enclosure. I witnessed some egg-laying only a week ago... things are settling into a rhythm. Starting to think about what winter will bring though. Best case - I bring the whole operation into the basement, but it's not exactly Florida down there. What happened with your rice cakes? We made a meal with them, and they weren't a hit. By the time I finished my plate I figured I could go a good, long time without another serving. They are very gluey and almost rubbery. I gave a test dose to the larvae after the leftovers were in the refrigerator for a while - it seemed OK, but when I gave them the rest I noticed some "sick" and even dead larvae over the next day or 2 while other areas of the composter were bustling and writhing. Could have been a coincidence, but I felt like maybe the cakes were obstructing some little guts. My BSF have gone wild and mating like crazy! It must be the light. After reading all of the previous posts about terrarium lights and special, expensive bulbs, who knew that one costing less than $3.00 would get the flies mating so furiously. I've got my cardboard rolls in the bin atop coffee grounds, which I check daily finding new clusters. I guess that's not enough because they are even laying them on the screen netting that I have covering the bin. I move about 2 clusters each day from the netting onto the coffee grounds. I just wish they would grow faster so I could move them to my Biopod. I searched your posts and I don't see where you've called out this miracle light by name... care to share? I'm brainstorming a clamshell idea inspired by Aussiemoo's indoor breeder box - that light looks great, but no reports on success yet that I've seen. ... I searched your posts and I don't see where you've called out this miracle light by name... care to share? Try the "My DIY Indoor breeder setup" (link) thread by Djeung. FYI you can easily search a users posts in their profile. jf371 I am beginning to doubt that it's the light that makes all the difference. I have tried all sorts of lights and combinations and none of them really seemed to be the trigger that would get my flies in the mood. I even had a similar setup to Djeung at one stage with a 500watt halogen light and natural sunlight behind it, but they just behaved the same as before. Maybe the Australian version of black soldier flies is especially resistant to indoor mating? At least I'm gathering a lot of information about what it DOESN'T take. 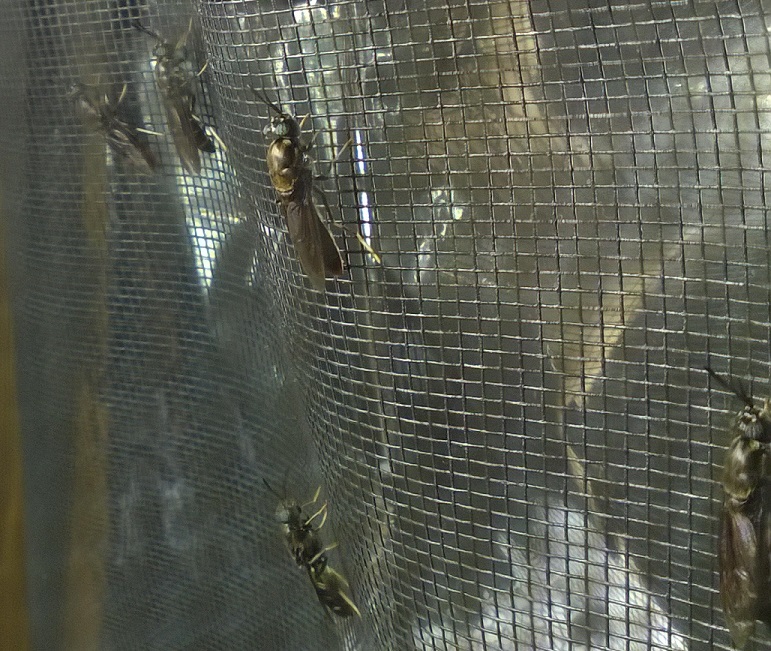 Maybe the Australian version of black soldier flies is especially resistant to indoor mating? Are you using wild flies or the 'domesticated' version?